Class Readiness: class II to X: to ensure that children acquire the stated academic standards to continue in the present class. a) To make children of classes II to X to learn pre-requisite skills necessary for the entry of the promoted class in the new academic year in all the curricular subjects. b) For primary the focus will be on Telugu, English, and Maths. In case of upper primary and high schools the focus will be curricular subjects. c) To revisit the concepts, recap the learning of the previous academic year which is mentioned in the school syllabus and teachers handbooks designed by SCERT. e) To Improve the retention rate, in other words to reduce drop out due to non learning or less learning. Afternoon Session: as part of class readiness programmme, day wise activities given in the class readiness module i.e., remedial teaching/tutoring/individualized teaching to be done in a creative manner. 1. 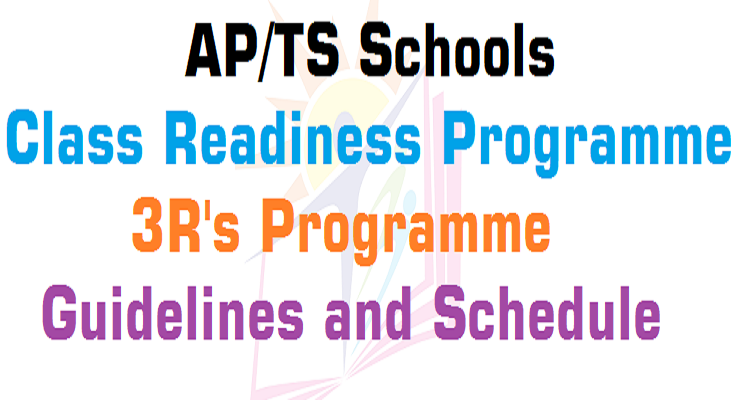 For classes 6th 10th , among the 48 periods, 30 periods are to be allocated to regular syllabus teaching and remaining 18 periods are to be allocated for class readiness programme for the subjects, Telugu, Urdu, English, Hindi, and Maths. 2. During the day, periods from morning session to be allocated to the class readiness programme in Tlugu, English, Hindi and maths afternoon session periods are to be allocated for regular syllabus. 3. Teacher should decide and divide the remedial teaching periods as per children performance. 4. Remedial teaching should be carried out hand to hand without disturbing the regular subject teaching. 5. Every week the progress of the child shall be recorded. 6. Invite the parents to the school to gain firsthand experience how the readiness programme is organized in the interest of the children. Interact with the parents on strengths and weakness of the child. 7. On 15th August, 2016, organize SMC meetings and invite parents and demonstrate the pupil performance achieved during the period of Readiness programme. 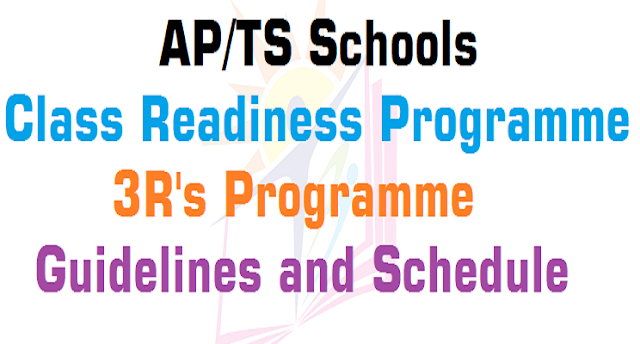 The CwSN of IERCs who attained minimum levels of academics will be mainstreamed in the school on 13th August,2015. 1. Every child should have acquired B or A grade in the mother tongue (Telugu&Urdu) and Mathematics. 2. Every child should be able to read and write in the mother tongue and do the mathematics correctly. 3. Every child should be able to read and write sentences correctly in the mother tongue and should have acquired creative skills and language skills as per the class specific academic standards. 4. Every child should be able to do the class relevant fundamental processes in mathematics and should have acquired the stated skills in mathematics as per the academic standards. Target Group: children who are admitted m classes II to X, Telugu/Urdu, English, Hindi &Maths. 2. Workbooks meant for summer camps for children of classes I&II and Ill, IV,&V, Snehabala cards and Text books and any other relevant material suitable to the levels of the children. 3. Concerned teacher should prepare the activities according to the needs of the child. 1. Out of a total 48 periods at the primary level, 20 periods should exclusively be meant for Mother Tongue & Mathematics only and the remaining hours for the teaching of the other subjects. 2. Daily Home work should be given and it should be corrected. 3. Maintain the children's performance register based on the earlier Annual Assessment Survey grading or any base line grading for 45 days readiness programme. 5. To record the class wise subject wise student performance of pre line and end line results in the prescribed formats of each school. 6. Every teacher should mentain the children performance track records according to the levels furnished by SPO. 3. Level III: Identification, Recognition, and Pronunciation oflanguage items. 4. Level IV: Reading and Writing of the Language items. 5. Level V: Reading and Writing of the words in the mother tongue. 7. Level VII: Perfection in the language skills. 3. Level III: To be able to do the two digits subtractions according to the class standards. 4. Level IV: to be able to do the two digits multiplication according to the class standards. 5. Level V: to be able to do the two digits divisions according to the class standards. 6. Level VI: to be able to grasp the tables according to the class standards. 1. To identify the children those who are lagging behind the basics in Mother tongue and Mathematics. 5. To ensure that every child acquires the stated Reading, Writing and Arithmetic in Mother tongue and in Mathematics before 5th August 2015. After completion of the training programme every child should attain the basic skills in languages and Mathmatics. 3. To take the responsibility to implement the programme. 1. Communicate the role ofHMs and teachers in implementation the programme. 2. Communicate to all the MEOs and all HMs to attend the teleconference on zo" June 2015 from 10.30 am to 4.30 pm on this programme. 3. To arrange and communicate the teleconference and also furnish the list of working centers also inform to the HMs of teleconference to arrange it.